The Department of Conservation’s Dumpling Hut on the Milford Track looks like any other visitor facility on the world famous Fiordland tramping trail... until you look more closely at the roof. What seems like a standard metal roof turns out to be a cleverly designed and manufactured solar power system that has been made to blend in with its surroundings. Dimond® Roofing's Solar-Rib® supplies power for visitors to Dumpling Hut, whilst maintaining a minimal environmental footprint. Using ColorCote® ZinaCore X™ pre-painted roof panels as its substrate, Solar-Rib® is the first self-contained, power-generating steel roofing profile that does away with unsightly older solar panel technology by incorporating the power generating cells right onto the structure of the roofing profile itself. 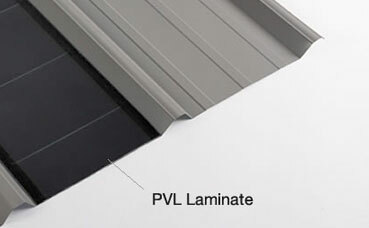 The 'photo-voltaics' used in Solar-Rib® come in the form of a laminate that is light and flexible, enabling it to be installed without the need of additional support from underneath, other than the standard roof purlins. This allows the roof to retain its crisp and clean appearance, without visually detracting from the pristine environment. Fabricated with ZinaCoreX™, Solar-Rib® is ideally suited for the harsh weather conditions experienced in Fiordland, with its high rainfall and cold winters. The hot-dipped aluminium/zinc alloy-coated steel substrate has a thicker coating of polyester primer, yielding improved corrosion resistance, outstanding gloss and colour retention, along with overall durability in severe environments. Putting Solar-Rib® to the "Kea Test"
The Dumpling Hut had another natural hazard to ward off – the inquisitive Kea alpine parrot. Prior to being installed, we placed a test panel at Mintaro Hut to test its "Kea-Proof" properties. Kea have been responsible for short-circuiting and even destroying power supplies in remote locations, but the Solar-Rib® design and use of the robust ColorCote® substrate foiled all attempts by the parrots to undermine it. We like to think that is really putting it to the test. Solar-Rib® has been successfully used in various residential and commercial installations, with one roof in Southland producing nearly 15-kilowatt hours of electricity per day. Operating in a wide variety of light conditions, Solar-Rib® can even perform admirably on cloudy days or in settings where snow or ice build up on the roof. With 50 Watts peak power per square metre, some installations have been known to produce most of a given building’s electrical needs and in some cases even return power to the national grid. Just think of that - having the power company pay for locally generated electricity.